He was so handsome, with his jet-black hair, standing by the swing. When he smiled, eyes would stand on end. It was schizophrenic - he was so messed up that she would do whatever he said. She wanted to listen to his sweet-talking, wanted him to talk until the moon was up. Then she stopped pinning her hopes on him. She couldn't let him off so easily for his betrayal. 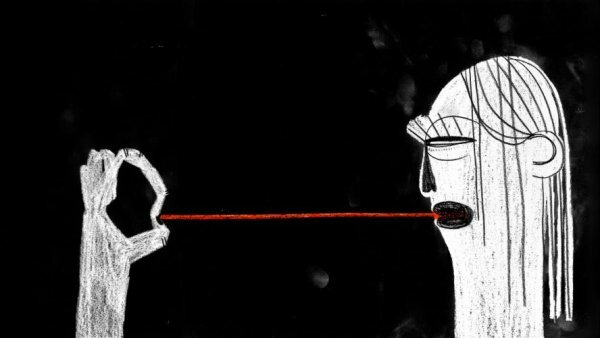 Ewa Borysewicz's animation is a secular litany and a story of affection ending in bitter disappointment, echoing through a tower block estate. Ewa Borysewicz made Do serca Twego after graduating from the Fine Arts Academy in Krakow. Her animated student film Kto by pomyślał? (Who Would Have Thought; 2009) received multiple awards in Poland and screened in competition at several international film festivals, including MIAF, Animateka, and PremiersPlans.